Every now and then, though, I like to do projects simply because I feel like somebody had to do it, so it might as well be me. Writing video games in shell script form definitely qualifies. 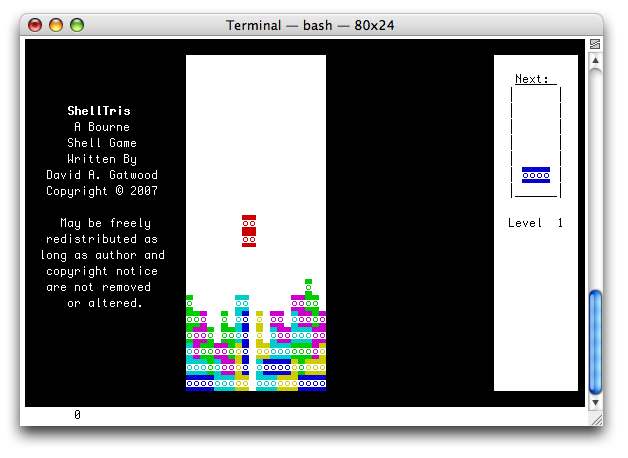 The first working game in the series is Shelltris, a shell-script-based game similar to the popular video game Tetris®. Screen shot below. Apart from a short C program to read a character from standard input in a non-blocking fashion (ten lines, not counting braces and #includes), the/game is written entirely in a Bourne shell script. The game play logic performs its own performance calibration and timing loops, uses ANSI color to draw the blocks, and perform mass array move operations and screen-at-a-time redraws to collapse rows when they are filled. Tetris is a registered trademark of V/O Elektronorgtechnika. Shelltris is not in any way associated with the trademark holder, and the trademark holder has not endorsed, supported, or contributed to these scripts in any way.